These days, you hear a lot about “binge-watching” TV series. Rose is a binge-watcher extraordinaire, from Mr. Robot to Gilmore Girls: A Year in the Life. Needless to say, I lack the attention span for a viewing marathon, and frankly prefer my entertainment spaced out a bit more anyway. Turns out that three year old Aiden is also a binge-watcher. Actually, he watches the exact same thing over and over, day after day, until he has all the dialogue memorized. This has been true for Thomas the Tank Engine, also Peppa Pig. But nothing so far has captivated him like a 1987 animated film that his dad had also loved, back in the day: The Brave Little Toaster. This quirky cartoon classic features a vacuum cleaner, a lamp, an electric blanket, a radio and, yes, a toaster. The friends have been left behind at a no longer used summer cottage, and decide to set off in search of their “master,” the little boy who used to live there. The chatty objects endure many setbacks, until at last they are reunited with their beloved master. 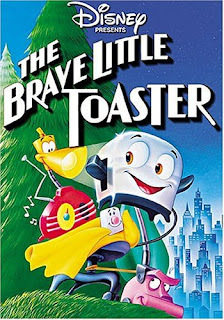 It is a hoot to watch Toaster with Aiden, who now says every word out loud right along with the movie. I can handle a daily dose of his current fave flick because it is so well done, and eventually Aiden will move along to something else. But can I (move along, that is)? The Brave Little Toaster really resonates with me, because I have a strange tendency to assign thoughts and feelings to my appliances and other inanimate objects in my life. I am loyal to them for years, decades even, and imagine them as part of the family, from the ancient clock radio/cassette player combo that still sits on our night table, to the electric skillet inherited from my mother-in-law that dates from the 1960’s. When my laptop computers die, I keep them around because I just can’t bear to part with them, remembering the many hours I pounded out essays and skits on their keyboards. This week, we are preparing to welcome a new refrigerator into our lives. Even I had to admit it was time for a change when the inside fridge temps reached the high 50’s and everything in the freezer melted. But I will miss our old model, and cherish the memories of childish artwork, postcards from traveling loved ones, and my newspaper columns, decorating its door. And the Amana—will it miss us, as it’s carted off? Will it reflect back fondly on Ya-Jhu’s soups and Evan’s marinades? Who knows? It stands in the kitchen, silent save for the faint whirring of its faulty motor. There will be a sleek replacement soon, but it will be awhile before our new Whirlpool stakes a claim on my heart. So farewell, my frost-free friend! I thank you for your service, and hope, someday, someone will be able to repair you, and come to love you as much as we did. Happy trails! After LTYM performance, with most of the fam! I can go for ages without stretching myself (and I don’t just mean yoga). Life can seem challenging enough just treading water, doing my job at church, writing on Thursdays (my day off from work). But then I will have spurts where I’m stretching all over the place. That describes this past month, when I found myself sharing a stage in Bethlehem, PA one weekend, and attending a large writer’s conference in New York City the next. When I first heard about the “Listen to Your Mother” shows, I was intrigued. LTYM began in 2010. The idea was to “give motherhood a microphone” and produce shows featuring 12 mothers reading their stories. Stories? About being a mom? Sign me up! was my initial reaction. But when I checked their website, I noticed that, while these shows were occurring all over the country, the nearest location to me was way up in the Lehigh Valley, a hilly hour and a half from home. Now, I enjoy a long solo drive to an unfamiliar area. Not. Add to that the crazy weather we’ve been having (snow/ice was part of the forecast the day of the first rehearsal)—they were real “white knuckle” trips. But I made it, and am glad I did. The other 11 readers represented a wide variety of motherhood experiences. One had been a surrogate, carrying a baby for a stranger. Another had lost her mother as a baby, and told of being raised, haphazardly, by her father. There were adoption stories, miscarriage stories, a story of a mom whose own mother had been abusive. One brave participant was nine months pregnant (she thankfully waited to deliver until AFTER the performance). Most of the tales were intense; many were touching. I was the oldest mom, with the oldest kids, so they put me last on the program. To a woman, everyone was lovely, and the show went very well. 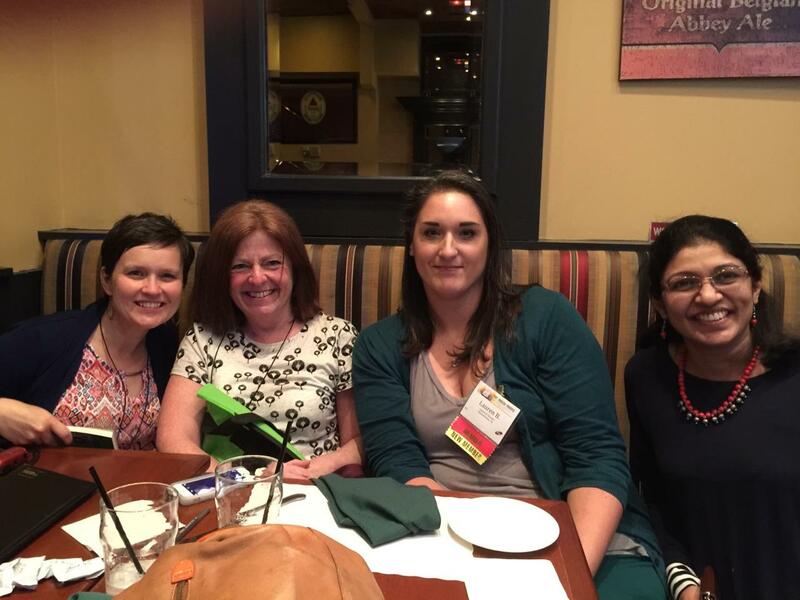 Lunch with fellow writers! Yay! Then last Saturday, I went to the American Society of Journalists and Authors (ASJA) conference in Manhattan. You have to qualify to join ASJA, with enough articles published in national newspapers and magazines. My resume isn’t there yet, but the day inspired me to reach for the next level as a writer. There were agents, publishers and editors there, offering wisdom. I found out what it takes to be published in the Washington Post and some top online sites. A highlight was my lunch with three writers, including the creator of “Beyond Your Blog.” Susan offers weekly tips, podcasts, and an exhaustive list of writing opportunities (I got my highest-paid writing gig through a Beyond Your Blog listing). By the end of the day, I was starting to feel at home in the company of big-time writers, and dared to hope I can join their ranks someday. Stretching is a good thing, I reminded myself. I plan to keep exploring challenging activities and see where they lead me. And who knows? I may even go back to yoga class. Maybe. Rose’s first project as a producer premiered last week at the Tribeca Film Festival in NYC. “Broken Night” will also be shown at the Cannes Film Festival in France later this month. This has been exciting for her, as it is not just an ordinary short movie. This is a “virtual reality” experience. 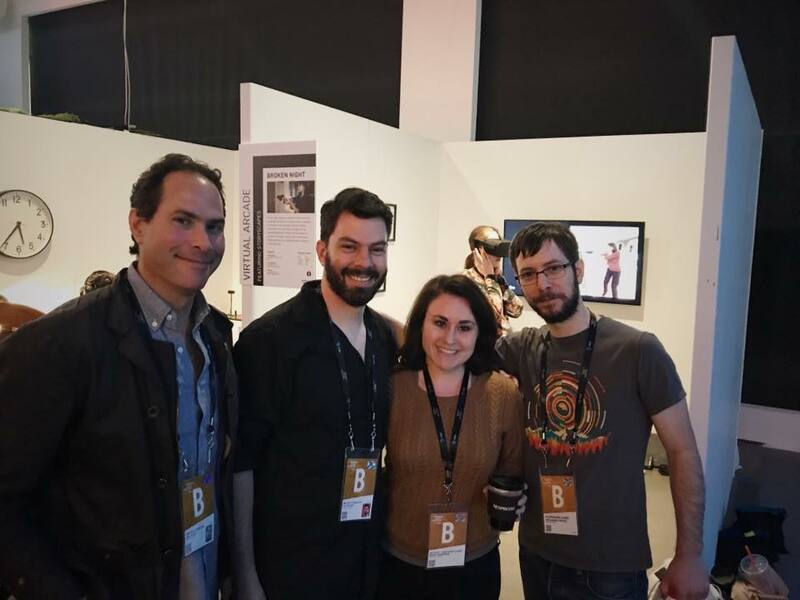 VR has already been used in video games, but using it in film is relatively new. The viewer puts on a headset, through which the movie is seen. Throughout, said viewer makes choices that determine how the plot will play out. This sophisticated setup actually tracks your vision, and adapts depending on which character you are looking at at a given time. I believe everything ends up in the same place, but it’s the getting there that changes from person to person. As you can imagine, this involved filming different scenarios for each choice made, so it was quite the production. “Broken Night” stars British actress Emily Mortimer in the leading role. The storyline revolves around an unstable woman’s undependable memories of a crime—a shooting in her home following an argument with her husband. An intruder is involved. Did she pull the trigger? Who was shot? A detective stands in for the viewer, asking questions, trying to clarify the sequence of events. I haven’t yet seen the film, but I sense it has the quality of a dream, where our self-conceived plots take weird twist and turns that we orchestrate subconsciously. Within our dreamscape, everything feels real—but there are certain moments when we are aware that it is NOT real. My reality check often comes when I am in peril. The thought surfaces: this is not happening. I awaken, and wonder about the strange choices my mind made in the dead of night, to steer my story one way or another. In a way, VR imitates our “real” lives, as we make the daily choices that affect our outcomes. Like VR, we may interact with others, but are still essentially alone in our unique experiences of life. As technology continues to improve, so will “virtual reality,” until there may come a day when it is impossible to know for sure which world we are inhabiting. I find VR as fascinating as I do frightening; the applications for good are there for sure, but I hate to think of us as becoming ever-more-separated islands, with our headsets keeping us focused on ourselves and the lonely shows we are producing in our minds. Sometimes I wonder if my whole life is part of someone else’s dream…but then I realize. It is. It is part of God’s dream for the world, and it is a dream of peace, and love, and joy. So as I make the choices that shape my reality, may I live into the big, baffling, yet beautiful picture that our God created. May I stop fearing progress, and instead be exhilarated by wonderful newness. The future is here, now. Let me embrace it all.